The Windows Clipboard is a place where the most recently cut or copied value is stored. This can be a value from Excel or any other Windows application. For example, you can copy a value from a web browser and paste it into a Notepad, Word, Excel, etc. Each clipboard value is replaced by the next one that is copied or cut because the Windows Clipboard stores a single value at a time. 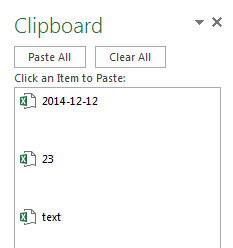 Similarly to the Windows clipboard, the Office Clipboard stores only one- last copied or cut value. If you need Excel to remember more than a single value, click the button in the HOME >> Clipboard group. The Office Clipboard will appear on the left side. Start copying cell contents, and they will appear automatically on the clipboard list. If you want to insert one of those values, select the cell where you want the value to be pasted and click the value from the clipboard. You can paste all values at once by using the Paste All button. If you want to get rid of the contents of the clipboard, click Clear All. The values stored in the Office Clipboard in one application can be accessed by other Microsoft Office applications. For example, if you copy the contents of a cell in Excel, then it will also be available in Word and vice versa.